There are times when you just need a go-to side dish for a party, whether you’re hosting or merely bringing. This is just one of those dishes, and it has the added benefit of being vegan – which means it can go for just about any crowd. It’s also possible that this is a gluten-free dish, but don’t quote me on that; I’m not an expert on gluten-free dieting. At least upon first glance on the mighty interwebs, it looks as though it may just be. I’m also in love with this dish because it’s stupid-easy to make and it’s best made in advance of a party, which also takes some of the pressure off trying to make EVERYTHING the day of. For regular lunch/dinnertime eating, I’d recommend just halving the recipe, or (what we often do) making the full recipe and taking leftovers as a side for lunches. 1. Rinse and drain the edamame. Make sure to shake the colander well to release any extra water. Place the edamame in a large mixing bowl. 2. Add the corn to the mixing bowl. 3. Rinse and drain the black beans; add to the mixing bowl. 4. Add the shallots, garlic and herbs to the bowl. Stir well to blend the ingredients. 5. In a separate bowl, prepare the dressing by adding all five ingredients to the bowl and stirring quickly until all dressing ingredients are mixed. 6. Add the dressing to the mixing bowl with the salad and stir well to coat the salad with the dressing. 7. Cover with plastic wrap and store in the refrigerator overnight. 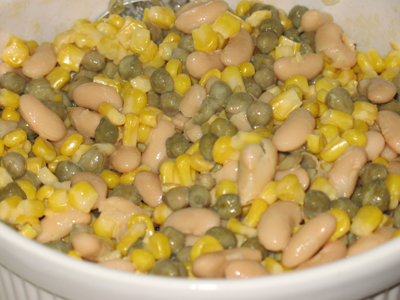 This salad can be prepared same-day IF the edamame and corn are well thawed so that they’re not completely frozen. However, the dressing gains a little strength & oomph by being left to sit overnight, so preparing the night before is preferable. If you want to throw it together the same day you’re eating it, I recommend putting the frozen corn and edamame into the refrigerator the day before, so they can thaw before you construct the salad. You can substitute fresh herbs for the dried ones noted above, but if you do make sure that you chop finely. This entry was posted in side dishes and tagged cooking, edamame, meal planning, party dish, salad, vegan, vegetables, vegetarian by crunchymetromom. Bookmark the permalink.